Our future expansion strategies contemplate offering Maid-Rite franchisees in all areas of the United States to accomodate our loyal customers and those who have yet to experience our "perfectly placed pickle on our signature Maid-Rite sandwich". This website is not an offer to sell a Maid-Rite franchise in, nor are the communications directed by Maid-Rite Corporation to the residents of, any state that requires registration before offering and selling a franchise in that state. No Maid-Rite franchise will be sold to a resident of any state until any required franchise offering registration has been completed in that state and the required Franchise Disclosure Document has been delivered to the prospective franchisee. 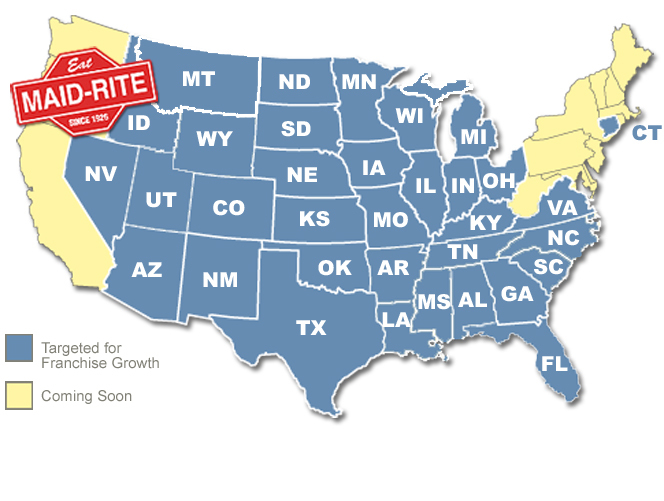 We look forward to bringing the Maid-Rite experience to your neighborhood soon! Contact us by phone, fax or e-mail to receive additional information about owning and operating your very own Maid-Rite.